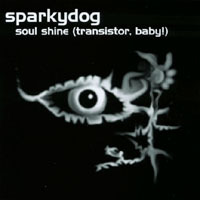 Sparkydog are an American indie rock band from Florida. 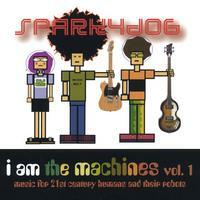 They have released 3 albums to date, as well as a number of singles on CMJ compilations. The band is primarily a studio band, although it has been known to play at the ocassional live show. The One Bird A Day - A Compilation of Songs by Sparkydog & Friends is a current active project. We produced 12,000+ CD's for the 2008 SXSW Music & Media Conference, which ran from March 7th-16th, 2008, in Austin, Texas, USA. The CD's were given free to all of the SXSW music attendees. The hope is to raise awareness for Superorganica, as well as the contributing artists. 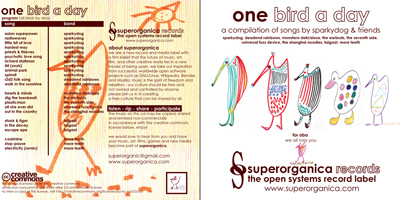 This will be the first release by Superorganica. Additional CD's are being produced for distribution to the press & college/independent radio. The entire album is available for free download and remix. notes: experimental, lofi, electro-folk rock. the cd received good college radio airplay, and some great reviews. "asian superpower" made few college radio top 20 lists. several songs were featured in CMJ CD compilations.